Present year-round in California; resident and winter visitor in south, mostly a transient and summer visitor in north. Common in southern deserts, fairly common in southern foothills, and uncommon to locally fairly common around margins of the Central Valley, in bordering foothills, and inner Coast Ranges. Frequents open woodlands of oaks and other small trees, shrubs and chaparral; often associated with mistletoe berries. Highest density occurs in sparse palm oasis, desert wash, and desert riparian habitats; also fairly common to uncommon in valley foothill hardwood, valley foothill hardwood-conifer, mixed chaparral, and orchard-vineyard habitats. Local occurrence is irregular and unpredictable. Much of the population in southern deserts reported to leave from early May through September, moving to more western and northern parts of range. 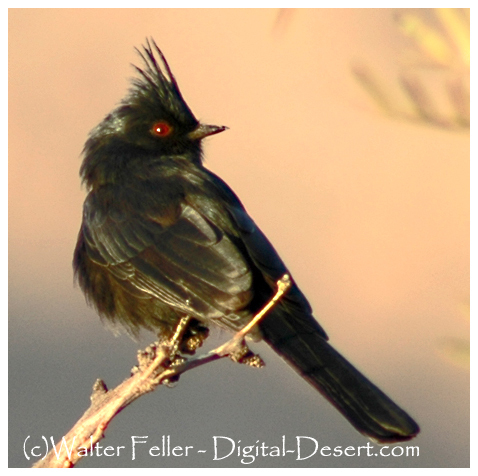 Evidence suggests that some individuals may nest first on southern deserts and again in summering area in the same year (Hoffmann 1927, Grinnell and Miller 1944, McCaskie et al. 1979, Garrett and Dunn 1981, Ehrlich et al. 1988). Feeding: Berries are the major food; also eats small insects, especially in nesting season. Nestlings fed both insects and berries. In California, heavily dependent on mistletoe berries (Grinnell and Miller 1944, Garrett and Dunn 1981) growing on mesquite, acacia, ironwood, cottonwood, blue oak, live oaks. Other important berries include juniper, elderberry, grape, buckthorn, poison-oak, and the introduced pepper-tree. Hawks insects in air, often by sallying from a high perch. Picks berries by clinging to clusters or hovering. Cover: Trees and large shrubs provide cover. Reproduction: Nests in dense foliage of a tree or large shrub, sometimes in a clump of mistletoe. Nest built 1.3 to 15 m (4-50 ft) above ground, usually 1.8 to 3.4 m (6-11 ft). Frequently nests near a berry source. Pattern: Frequents low-elevation woodlands with scattered trees, understory, or adjacent dense shrubs, and a source of berries. 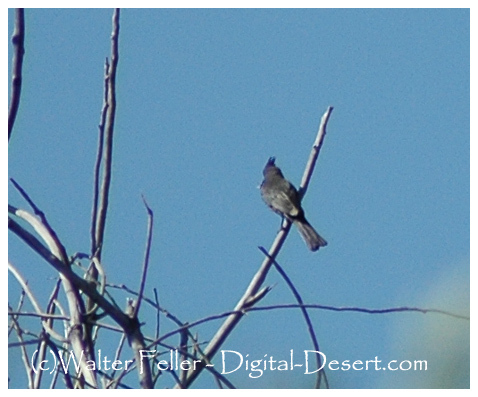 Seasonal Movements/Migration: Resident and winter visitor in southern California. Most move out from southern deserts in April or May, moving to more western and northern parts of California. Most return to the deserts by September or October. Home Range: Van Velzen (1977) reported density of 36 territorial males or females per 40 ha (100 ac) in desert wash habitat, and 74 per 40 ha (100 ac) in desert riparian habitat in San Bernardino Co. Territory: In Imperial Co., territory varied from 0.2 to 0.6 ha (0.5 to 1.5 ac) and averaged 0.4ha (1 ac) (Walsberg 1977). In desert riparian habitat along the Lower Colorado River in Arizona, territory varied from 0.59 to 1.03 ha (1.5 to 2.6 ac) (Laudenslayer 1981). Reproduction: Nests late February into April in deserts, and late May to late July in western and northern areas (Bent 1950). A monogamous, solitary nester; clutch size 1-4, average 2.5. May raise a brood on southern deserts and another after moving to summering area (Garrett and Dunn 1981). Incubation lasts 14-15 days. Altricial young tended by both parents and leave nest at 18-19 days. Young probably breed first at 1 yr (Harrison 1978). Niche: Defends fruiting mistletoe from other species (Walsberg 1977).